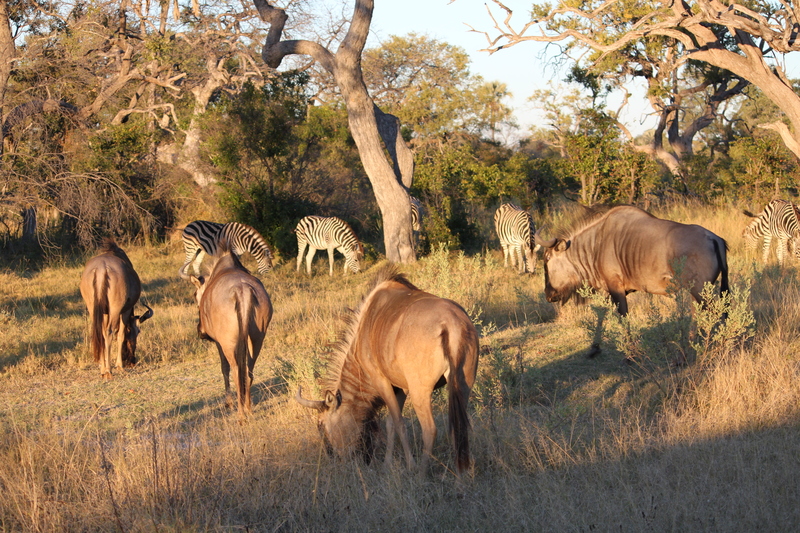 We saw these wildebeests and zebras in the Okavango Delta, Botswana. It was dinnertime so they didn’t pay any attention to us. This entry was posted in Africa, Travel, Travel Photos and tagged Africa, Botswana, Nature Photography, Nature Photos, Okavango Delta, Photos, Travel Blog, Travel Journal, Travel Photos, Wildebeests, Zebras. Bookmark the permalink. Sounds like a lovely collection Nia! Amazing how some creatures are so comfortable mingling amongst others and sharing food! Great shot! I was surprised by it as well. AAwwww, I love that picture. Wildebeasts and Zebras happily munching away in perfect harmony! It was fun to watch and peaceful. Wow, what an amazing group of animals. Did you love being in Africa? I really really did. I can’t explain how much I loved it there. It was one of the most amazing experiences of my life. It seems like everyone says that about Africa. I may have to go. . . .
Nice photo! It looks like you were really close to those animals! We were! It was wonderful! Well thats looking at the arse end of things… Thats all i’ve got. LOL Nate…I couldn’t get to the other side. Botswana is maybe the best place for see wild life… but, hey, it’s quite expensive… Really wish I was there! I wish I was back there! But I’ll have to save up again. Thanks for stopping by. ohh what a great picture! All these beautiful creatures in one place! It was fun to see! Great shot! Africa is very much on my bucket list! Great photo! You must have been close! Pretty close. It was amazing! It was a great part of the trip. What an amazing photo! I have never been in real Africa, if not counting the Nile cruise. I can’t wait to see the Nile…so cool! I think it was the former.